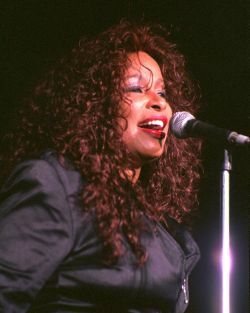 2001 was in fact VERY a busy year for Chaka, and when she wasn't spending time as a newlywed, or on tour, she sang at a variety of functions, and appeared at high profile events like the 2001 Essence Awards in New York, and she a featured performer on the Soul Train Hall Of Fame show, which honored Luther Vandross in 2001.Chaka was on point as she sang 'Creepin', and later joined Patti LaBelle & Luther for the finale of the show, 'Stop To Love'. It was a great show, BUT things would prove to get MUCH BETTER for Chaka (& us 'Chakaholics') before 2001 ended!! The long-awaited reunion with Rufus has always been on the mind of many a 'Chakaholic', so when a reunion tour was announced in July 2001, our wish was now coming true. Rufus & Chaka Khan would eventually reunite & tour as the opening act for Earth, Wind & Fire from September 2001 through early October 2001, and the overwhelming response from critics & fans was that 'the magic' was still there!! The positive reviews were generally reserved for Rufus & Chaka, while EWF were labeled 'a circus act' & 'an old shell of thier former great selves'. Following the reunion tour with Rufus, Chaka began to work on her newest solo CD, and she also stated that she would once again record with Rufus, but the details are sketchy at best, but it may actually happen since Chaka & Rufus are 'friendly' again. In addition to a 'possible' CD with Rufus, Chaka also mentioned things like a new DVD, but as of 4/2002, those projects are still on hold until she completes her next (& long awaited!!) solo project. Next year (2003) will mark Chaka's 30th Anniversary as a recording artist, and hopefully she will bless us with a new recording by then, but she is still putting the finishing touches on her newest project (on her own EarthSong Label), which may feature Mary J.Blige, Jill Scott, and Angie Stone as guests. Being the talented singer that she is, Chaka's future has many possiblities, which may include an official autobiography, a reunion CD with Rufus, a gospel album, a box set compilation, or even more acting. With her own high standards & expectations of herself, Chaka will tackle any project with 100% effort, and we will love the results! Chaka Khan is very much the 'Diva For All Seasons' (& styles!! ).